The Consortium has been a hive of activity these past months, thanks in large part to the dedicated efforts of the small-but-mighty MTI staff and an able team of directors who keep the big picture in focus. We’re pleased to bring you up to date with a few of the recent highlights. MNTRC Board of Directors. Left to right: New Board Chair Nuria Fernandez; Transportation Secretary (ret.) Norman Mineta; Executive Director Karen Philbrick; Executive Director Emeritus Rod Diridon; Emeritus Trustee David Turney; and Trustee Beverley Swaim-Staley. The MNTRC was pleased to welcome Nuria Fernandez, CEO of the Valley Transportation Authority (VTA), as its new chair, and Grace Crunican, general manager of Bay Area Rapid Transit (BART), as vice chair, at its semiannual business meeting on June 27. These experienced MNTRC trustees have impressive records of accomplishment and dynamic leadership skills. The Board also welcomed three new trustees: Donna DeMartino, CEO of San Joaquin Regional Transit District; Art Leahy, CEO of Metrolink; and Abbas Mohaddes, CEO of Mohaddes Group. Learn more about them in the Board Profile section of this newsletter. The Board bid farewell to trustees Thomas Barron, group president at Parsons Corporation, who served from 2010 to 2015; Donald Camph, president of the California Institute for Technology Exchange, whose long service ran from 1992 to 2015; and Stephanie Pinson, president of Gilbert Tweed Associates, who served from 2004 to 2015 and was chair from 2014 to 2015. Asha Weinstein Agrawal presents the latest results of MTI’s public opinion survey regarding transportation taxes and fees. MTI hosted its annual transportation finance summit June 26 at the Commonwealth Club in San Francisco. This year’s event, titled Fund Federal Transportation Investment Now! featured California State Senator and chair of the Senate Transportation and Housing Committee Jim Beall as keynote speaker. He was introduced by MTI founder Norman Mineta, US Secretary of Transportation (ret). MTI Director of Transportation Finance Dr. Asha Agrawal presented the most recent results of a multi-year public opinion survey on transportation taxes and fees. Her report, What Do Americans Think About Federal Tax Options to Support Public Transit, Highways, and Local Streets and Roads? Results from Year Six of a National Survey, can be downloaded from the MTI website. Local, regional, state, and federal perspectives on funding were represented by a panel of experts, including Emily Bacque, policy director for CJ Lake; Grace Crunican, general manager of BART; Carl Guardino, CEO of Silicon Valley Leadership Group; and Steve Heminger, CEO of the Metropolitan Transportation Commission. The program was broadcast on NPR. Donna DeMartino, mentioned earlier as a new member of the MNTRC Board, was named Alumna of the Year by the MSTM Alumni Association. She was hailed for her professional accomplishments as well as her expertise as an instructor in the MSTM program. Allie Scrivener, new MSTM graduate and valedictorian for her the class, was awarded the inaugural Congressman James Oberstar Award for Academic Achievement. The presentation was made by the late Congressman’s son, Ted Link-Oberstar, a policy consultant at the California Senate Office of Research. Ms. Scrivener just earned her MSTM and was valedictorian for her the Class of 2015. An ambitious team from Guntown Middle School of Guntown, MS, received this year’s Garrett Morgan Sustainable Transportation Award and a check for $1,000. The team’s winning plan proposed to increase awareness of hydrogen-powered vehicles and boost availability of hydrogen fueling stations. Accepting the award were teacher Connie Gusmus, mentor Julia Smith, and student team members Brandon Dillard and Luke Smith. The status of emeritus trustee is a rare honor reserved for those who have served with exceptional longevity and achieved specific outstanding accomplishments. It is so rare, in fact, that over the past quarter-century, only six MTI trustees have attained it. Thus, MTI was tremendously gratified to bestow the title of emeritus trustee on not one but two remarkable individuals at this year’s event: David Turney, CEO and Founding Principal, EEI Strategic Consulting, who served as an MTI Trustee from 1992 to 2012 and chair from 2006 to 2008, and Stephanie Pinson, whose service was detailed above. Together, they cofounded the MTI Student Scholarship Endowment, which will provide financial support for MSTM students in perpetuity. Finally, MTI was honored to receive a commendation on behalf of the City of San Jose from Mayor Sam Liccardo for excellence in transportation policy leadership. 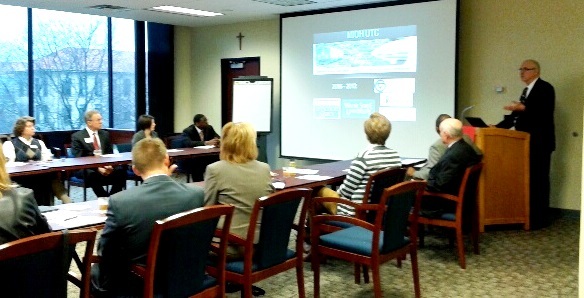 The Council of University Transportation Centers (CUTC) held its summer meeting at Rutgers University. MNTRC Director of Communications Donna Maurillo gave a presentation on the Consortium's successful marketing and social media strategy, and MNTRC Executive Director Dr. Karen Philbrick was elected Treasurer for the Council. Three new Trustees have joined the Mineta National Transit Research Consortium board. Each one will contribute specific expertise and guidance to MNTRC policies, management, and operation. Donna DeMartino is a graduate of our Master of Science in Transportation Management program. She also has been an instructor of multimodal transportation. 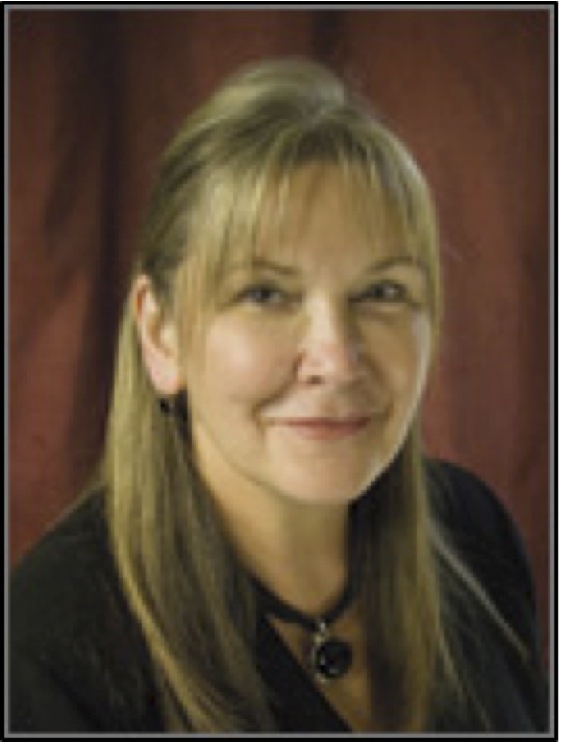 She was appointed the San Joaquin Regional Transportation District’s general manager/CEO in 2001. 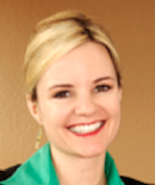 The California Transit Association selected her to chair its Executive Committee in 2013. Ms. DeMartino is a fellow of the Eno Transportation Foundation and a graduate of Leadership APTA. 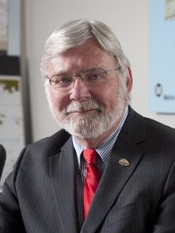 Art Leahy began serving as Metrolink’s CEO in April 2015. He contributes more than 40 years of public transportation experience. 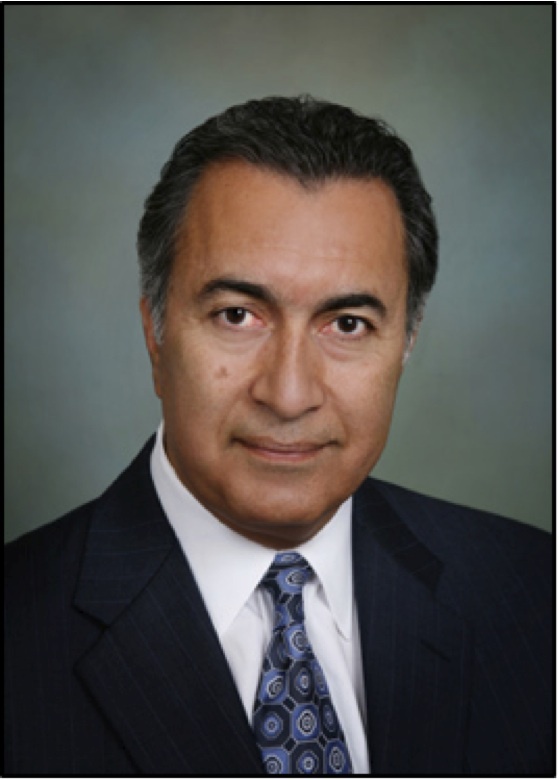 He was CEO of the Los Angeles County Metropolitan Transportation Authority (Metro) for six years. During that time, he guided implementation of one of the largest public works programs in United States history. He led completion of numerous projects funded by LA County’s Measure R. Metro has transit and highway projects valued at more than $14 billion. He earned a Master of Public Administration from the University of Southern California and a BA from California State University, Los Angeles in political science. Abbas Mohaddes is CEO of the Mohaddes Group, offering policy and strategic technology-based solutions in traffic and transportation. He acquired more than 30 years’ experience applying technology in transportation systems. He is an internationally recognized expert in ITS, and has published and presented numerous articles at industry organizations around the world. He holds a B.S. in civil engineering and a master’s degree in transportation engineering from the University of Nebraska-Lincoln. Improved energy sources are critical for future demands. A video created by Grand Valley State University highlights work funded by the Mineta National Transit Research Consortium to reuse batteries to keep toxic pollutants out of landfills. The research concerns itself with remanufacturing, repurposing, and recycling of post-vehicle-application, lithium-ion batteries, which can be used for a significant amount of time after they have outlived their automotive usefulness. In the video, Charles Standridge, PhD, comments that energy is a new frontier and that it’s exciting to be involved at this juncture. He notes that it serves no purpose to teach students about energy that’s based in 20-year-old science. We have to look forward and develop new sources – including the incredible wind power available on Lake Michigan. The video can be viewed online. Many innovative vehicles competed in the annual automotive challenge. The 21st Century Automotive Challenge, hosted by the Larson Institute at Penn State, closed out another successful annual event. This is a transportation and lifestyle efficiency competition for college, high school, commercial, and private teams. The object of the three-day event is to demonstrate lifestyle energy efficiency and vehicle emissions improvements. Vehicles are tested across many technologies – EV, HEV, fuel cell, biodiesel, ethanol, hydrogen, micro-vehicles, advanced combustion, and more. Competing in these categories were a subset that included production or prototype vehicles; light duty or heavy duty; local or local and highway; and seating for 1-2, 3-5, and 6 or more. It’s always an exciting event, as cars and trucks compete on highway and local routes, and with charging, cargo, tailgating, and obstacle courses. Plenty of food and fun are part of the event. Those who drove their vehicles more than 100 miles to the Challenge were awarded extra “range readiness” points. Courses included a 104-mile round trip, a nine-mile trip to the test track, laps around the test track, and other tests. Probably the most fun are the courses that include “errands,” such as taking a photo at the Nittany Lion statue and another at the fish hatchery, and stopping for ice cream at a local dairy. As California and other states move forward with high-speed rail plans, some have questioned the system’s ability to withstand earthquakes. This is especially critical in California, an active quake zone. A new peer-reviewed research report from the Mineta Transportation Institute says that valuable lessons are easily adapted from Japan’s successes with its early earthquake warning (EEW) systems. Great East Japan Earthquake, JR East Mitigation Successes, and Lessons for California High-Speed Rail is available for free download on the MTI website. MTI research associates Dr. Frances Edwards and Mr. Dan Goodrich noted that JR East, a Japanese rail company, has developed systems to mitigate the damage to its facilities and personnel, including an EEW, retrofitting existing facilities for seismic safety, developing more seismically resistant designs for new facilities, and holding earthquake response training and exercises for company staff. Such systems demonstrated their value in the Great East Japan Earthquake of 2011 and have been further developed based on that experience. Researchers in California are developing an EEW system for the state, and the private sector has seismic sensors in place. These technologies could contribute to the safety of the California High-Speed Rail Authority’s developing system, which could emulate Japan’s best practices. A seismic early warning system is a critical link in system operational safety, especially if it can incorporate power shut-off and automated brake application. California’s High-Speed Rail system should be built with seismic resilience as a design parameter for infrastructure. 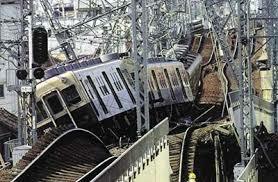 Earthquake safety and response training for rail system staff and passengers is essential to increase the likelihood of passenger and crew survival in an earthquake. Earning a Master of Science in Transportation Management (MSTM) through the Mineta Transportation Institute has given a career boost to many – sometimes even before they graduate. We received news that three of our alumni have earned promotions in their jobs. 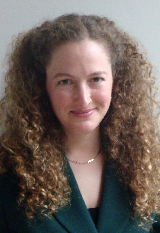 Robin O’Hara (MSTM, 2012) is now Deputy Executive Officer at Los Angeles County Metropolitan Transportation Authority (LA Metro), where she directs all aspects of customer experience for TAP digital fare card system. Previously, she was Director of TAP Technical Systems. Robin also co-authored a book chapter on using social media for transit systems. MSTM student Russ Kerwin, a Senior Cost Schedule Analyst at the international engineering consulting firm AECOM, now serves as Deputy Project Manager for Metrolink's Positive Train Control (PTC) Program. These three professionals are using their educations directly in their careers and proving the value of an MSTM. Congratulations to all who have done the same. In early June, the Mineta Transportation Institute (MTI) co-sponsored the four-day High-Speed Rail Technical Seminar on the San Jose State University campus. The purpose was to promote knowledge of high-speed railway technologies, especially to graduate engineers and specialized professionals. Experts provided in-depth technical information on signaling, catenary engineering, electrical disturbances, and other topics. Through these master classes, the organizers expected to provide and expand a resource base for California’s high-speed rail development and to bring students into contact with multinational leaders in these technologies. Presentations were given by senior engineers and others with high-speed rail experience around the globe, including Antonio Arribas, Eduardo Romo Urroz, Peter Gertler, Michel Leboeuf, Chakri Gavini, and many others. MTI Emeritus Executive Director Rod Diridon also addressed the assembly on opening day, and Jeff Morales, CEO of the California High-Speed Rail Authority, gave an introduction of characteristics and targets for the state’s system, now under construction. The seminar also addressed the types of jobs that the new system would create, the obstacles that still must be overcome, California’s federal support for construction, and much more. Many students were given full scholarships to attend. University presidents discuss their ideas for improved transit service. In southeastern Michigan, 17 university presidents are on board with transit. They (or their delegates) met on the UDM campus in April to discuss how they can involve their campus communities in bringing improved transit services to the forefront. Some were frustrated that transit isn’t always convenient for their students, so options were discussed to help boost availability. This is especially valuable for evening classes when students live off-campus. Many foreign students rely on transit because many don’t own cars. It’s also an issue for community people who rely on services at the dental and law schools. Coordination among various transit systems is also a problem, and few options exist if students are taking classes at more than one campus. Another problem is that those who live on campus don’t always have convenient access to malls, central business districts, or other places for shopping and entertainment. This was considered an economic loss for local communities. The educators agreed to take specific actions to help define and alleviate the problem. Specifically, they agreed that: No “one-size” solution fits all campuses; campuses in southeast Michigan are not well-served by transit; each campus will hold a “listening session” with students, faculty, and staff; each campus will encourage student participation in the transit planning; and each campus will work to help change the culture of transit so more people will take it. The X Train is the picture of comfort for riders. It’s not every company that would think to tap the talent of local university students to help design a rail route. But that’s just what Las Vegas Railway Express did. Their executives have joined with engineering students through the University Transportation Research Center at the University of Nevada, Las Vegas. Working with railway executives and Hualiang “Harry” Teng, PhD, the students will develop a route from Los Angeles to Las Vegas using existing tracks. 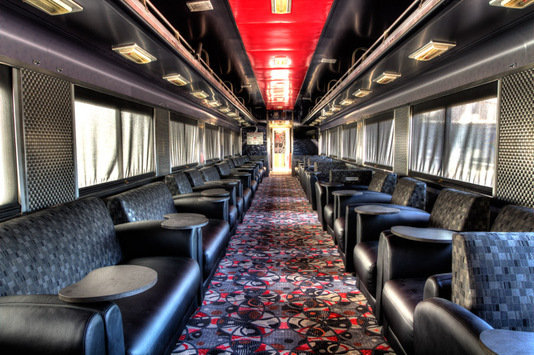 The so-called “X Train” will be a leisurely transport aboard several refurbished cars decorated with a party atmosphere and luxury accommodations. After it conducts several test runs, the company plans to launch officially on New Year’s Eve 2015. The students and visiting scholars are developing train operation simulations using software that forecasts demand and travel times. By the end of the project, the students will have gained relevant experience that can be applied to their future careers. Existing tracks for the X Train traverse from Los Angeles through Palmdale, Lancaster, Mojave, and Barstow before reaching Las Vegas. The students also will analyze a second route for possible use.